Holy Mackerel! There's a brewery in Davie! That's right, Bobby Gordash (of Holy Mackerel Beer Fame) recently opened a nano-brewery called The Mack House. Bobby wanted to have a place where he could brew small-batch experimental beers and test them out on his guinea pigs. And the ByTheGlassShow crew was invited out to do an on-site broadcast and be those test subjects for a few of the newest beers. I tagged along. After Brett introduced the show, we wasted no time starting off with a half mead, half strong ale Braggot called Honey Do This! Sugary with very honey-forward flavors. Sweet and rich, but with a decent amount of hops at the end. The 9.5% alcohol also helped thin out the richness. Ballsy to make a Braggot! Nice job, Bobby G! 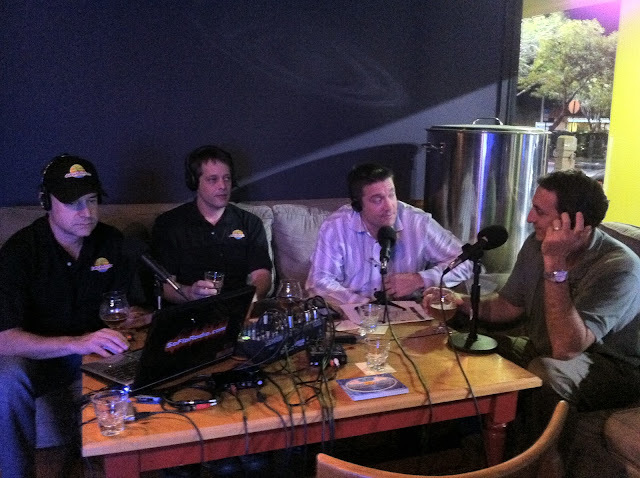 Bobby then took the guest mic and told us all about The Mack House and what he plans to achieve with his nano-brewery. He also talked about his new partnership with SmashBurger, a gourmet burger chain that has a beer-paired menu. Bobby mentioned a few of them to consider: his favorite, Spicy Baha Burger with Panic Attack and the most interesting, Cucumber and Goat Cheese Chicken Sandwich with Mack in Black. While Bobby was being interviewed, we sampled his newest beer, Sour Cherry Porter, served on nitro. You could tell the beer had a porter base, but the sour cherries stood out, especially at the finish. Velvety texture and very enjoyable. After a break, I moved back into the guest chair and we tried one of The Mack House's guest beers. 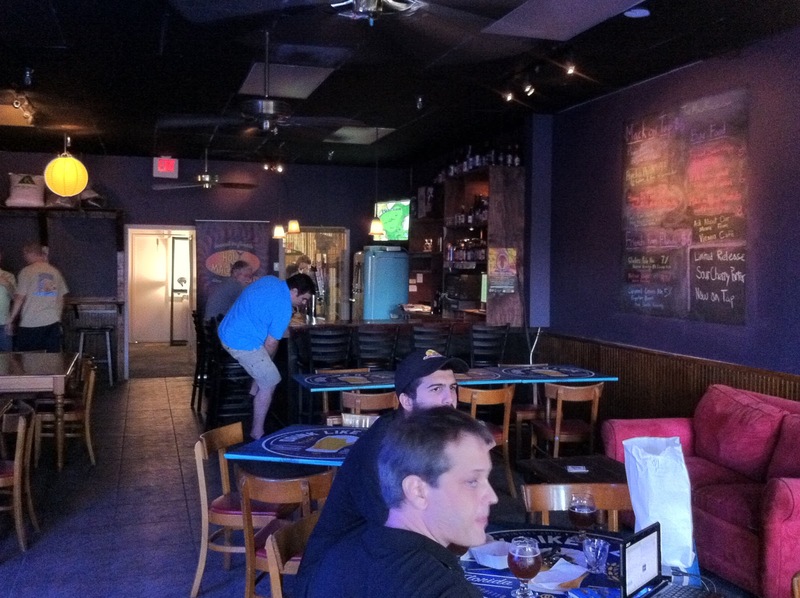 Bobby told us that he will only have Florida beers on tap there, that there is a bond and partnership between the local brewers. So we were given a taste of Native Brewing's Glades Pale Ale. Everyone agreed that it smelled like cat piss, with the utmost respect of course. And even Jorge and Jason and their non-IPA selves really enjoyed it. Fresh and clean, quite floral. Hoppy, but with enough malty sweetness to cause some disagreement as to whether it was really a Pale Ale or more like an IPA. It was borderline, but I voted Pale Ale. Just as everyone was patting themselves on the back for attributing the hoppy goodness to Cascade hops, Adam Fine walked in and let us know that we were tasting a new hop called Zythos. Adam is the brewer of Glades Pale Ale and founder of the awesome craft beer distributor Fresh Beer. The show was almost over, so Adam took the guest seat and chatted a little with the show. We didn't get to try the beer on-air that I was most looking forward to, their Panic con Pablo, which is Holy Mackerel Panic Attack infused with Cafe Don Pablo Gourmet Coffee from Miami. So I ordered a glass of that along with some Ale Glazed Meatballs which are made with a Mack in Black sauce. You could taste that sugary, fruity, spicy, boozy goodness of the Panic attack, but on top of that was a terrific coffee flavor. The coffee quality was excellent and it really added an awesome touch to an already great beer. Very enjoyable. Well, that's it. It was nice to finally get to see The Mack House and I'm always happy to be invited back to the By The Glass Show. I've gotta keep up my game to stay ahead of the multiple appearances by Ruth from Bon Beer Voyage. Yeah, I linked to the page above but here it is again. http://bytheglassshow.com/index.php/live-remote-from-the-mack-house/ Audio and Podcast, no tease. I guess maybe I should have clicked the link :p Thanks for that again though, I will be sure to give it a listen.